Comments Off on Why Choose a Business Solution from Microsoft? If you’re like a lot of small and midsize businesses (SMBs) today, your current systems are nudging you further and further out of your comfort zone. They get the basic job done, as long as nothing out of the ordinary happens. But what will happen when you want to open a new store or warehouse, expand to new markets, or add an additional line of business? Do you find it harder to connect with suppliers and customers, comply with new tax laws or environmental regulations, or keep customers loyal with the new competition you face in a global economy? These scenarios aren’t business as usual, but they’re part of the new normal. And if it’s getting harder for your existing systems to keep your business moving forward, now’s the time to take action. As you consider and weigh the alternatives, you’ll find products and vendors that sound a lot alike, and you may find it hard to differentiate between them. So Columbus has created a series of 10 whiteboard videos that answer frequently asked questions by small and medium sized businesses during the ERP (Enterprise Resource Planning) evaluation process. Integrated business intelligence, collaboration, and communication tools that span your core business processes. A user experience that blends personal and work computing and inspires your people and your customers. Anytime, anywhere access to make your people more productive. Microsoft delivers a comprehensive vision for SMBs that goes beyond traditional ERP and stand-alone accounting software. For example, business intelligence, collaboration, and communication capabilities are embedded across your business processes, so your people can quickly and easily find and analyze information, collaborate with each other to generate the best ideas and decisions, and communicate regardless of their locations or the devices they’re using. A consistent user experience supports rapid adoption, ease of use, and end-user productivity. 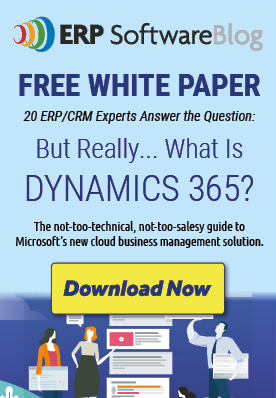 Consumer-driven technologies such as chat, presence, and action panes have been incorporated into Microsoft Dynamics ERP solutions, setting the standard for great user experiences. Flexible deployment models—on-premises or in the cloud—let you make the decision on what’s best for your business, and rapid implementation tools help you get up and running quickly. And finally, Microsoft Dynamics ERP solutions offer online or traditional desktop access, enabling anytime, anywhere productivity. 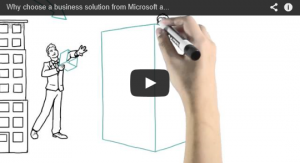 Watch the video “Why choose a business solution from Microsoft” here. Check back frequently for more videos from our series on the "Top 10 Questions to Ask About a Business Solution from Microsoft" or contact us today! Posted in About Microsoft Dynamics GP, Compare Accounting Software Packages, ERP Software Implementation Tips, ERP Software Information, Videos - Microsoft Dynamics ERP | Comments Off on Why Choose a Business Solution from Microsoft?